On the bare rock slope on the west side of the Iwasaki mountain in the Tomizawa District is a 2.4 m tall Amidanyoraizazo and a variety of large and small Buddha carvings. Several Buddha statues are from the late Kamakura period, and the thirty-three kannon from the Edo period cover the hillside. The oldest of them all that can be confirmed are the 4 Kokuuzoubosatsu (Ākāśagarbha Bodhisattva) statues which were carved in the 2nd year of Einin period (1294). It was designated as a prefecture historic site in 1971. 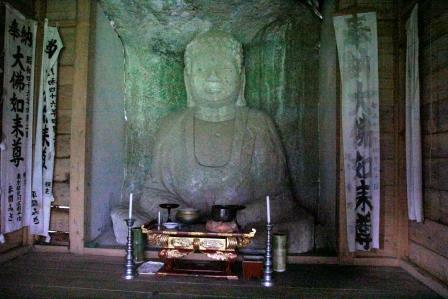 The Amidanyoraizazo are commonly referred to as the "Tomizawa Buddha", and it is said that, Fujigorou Keiichibou carved this statue for the memory service of his father. A temple was constructed in 1965 to protect the Tomizawa Buddha from wind erosion so you can still identify the distinct features but there are many others where erosion made the features indistinguishable.